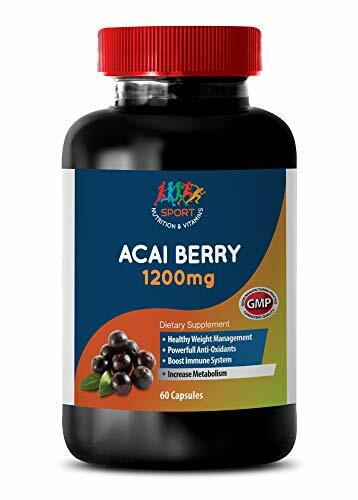 SUPPORTS HEALTHY WEIGHT: Some experts believe that acai berry has certain appetite-suppressing abilities thanks to how it effects various compounds that control blood sugar levels and feelings of hunger, fullness and satiety. It seems to help improve metabolic functions which helps the system work better absorbing nutrients, breaking down foods, eliminating waste and regulating the release of compounds that control hunger. HEART HEALTH BENEFITS: Research shows that acai berries are extremely high in anthocyanins, antioxidants that promote overall heart health. A 2014 study done concluded that acai berry can significantly helps in the calming of heart-related conditions. Another study was done in California on 10 overweight individuals who were given acai berry fruit pulp for 30 days. BOOST OF ANTIOXIDANTS: No doubt about it, there's quite a long list of health benefits that are attributed to acai berries. Most of the benefits you'll get from eating acai berry is due to its extremely high antioxidant content, which is why it's said to have a high "ORAC score." ORAC stands for Oxygen Radical Absorbance Capacity; it's a scale that measures the antioxidant properties of foods. ENERGY BENEFITS: Acai berries are rich in carbohydrates, proteins, and good fats that help to keep our stamina and energy levels high. Acai berries contain amino acids which help promote muscle performance, energy production, endurance and strength. Acai berries are packed with antioxidants, amino acids, fiber, essential fatty acids, vitamins and minerals making it a near perfect energizing fruit. ACAI BERRY: This natural supplement is made solely from Acai Berries. It has many benefits that can help you maintain good overall health. A super antioxidant that can help you achieve your weight loss goals, boost your immune system, give you extra energy, boost your skin to look healthy and mant more! IMMUNE SYSTEM SUPPORTER: One of the greatest benefits of acai berries is their ability to boost and strengthen the immune system. The antioxidant-rich fruits fight the free radicals and protect your system from several conditions. A 2011 study showed that the immune responses of acai berry have the potential to calm difficulty of breathing and harmful conditions. BRAIN SUPPORTER: Eating plenty of foods with antioxidants is a natural way to improve your focus and memory. Inflammation and oxidative stress are two major underlying causes of cognitive conditions, including poor memory, and other age-related mental conditions. Through a process of suppressing biological activity that makes cellular integrity poor, acai pulp fractions seem to have supportive effects over brain, which could have implications for improved cognitive and motor functions. HEALTHY SKIN BOOST: Acai berry is useful for early signs of aging and helping with skin support. For millenia people have used antioxidant-rich foods and herbal supplements, including acai, both topically and internally to help skin conditions and keep skin resilient and healthy looking. In people who develop high levels of oxidative stress, their skin is often one of the first things to show this. If you have any questions about this product by Sport Nutrition & Vitamins USA, contact us by completing and submitting the form below. If you are looking for a specif part number, please include it with your message.